Join Paltalk a new kind of game: Fantasy Flair! in an online game full of fun and flair! to uncover diamonds so rare! 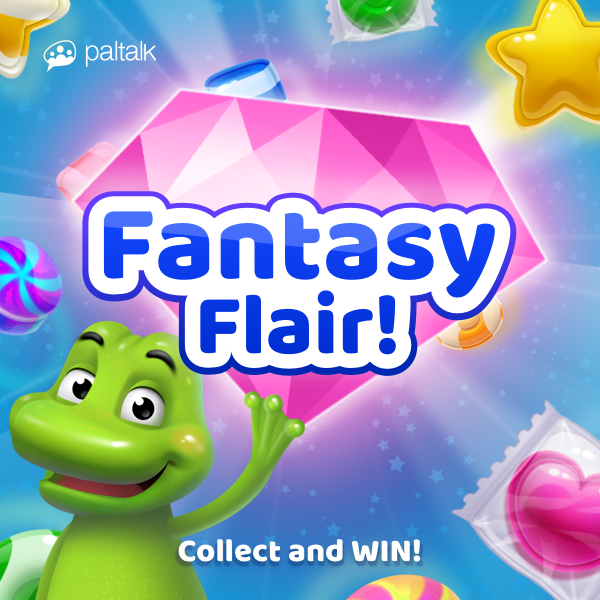 Hop on Paltalk for Desktop and collect brand new Fantasy Flair (in the Fantasy Flair category) to win exclusive flair available nowhere else. Collect 4 solid gifts of the same color to complete Level 1 and receive an Orange Diamond Flair! Collect all 4 gifts from the same pack to complete Level 2 and receive a Pink Diamond Flair! Collect 5 gifts of the same color and stripe to complete Level 3 and receive an Ice Blue Diamond Flair! Collect all 6 packaged mini gifts to complete Level 4 and receive a Green Diamond Flair! Collect all 12 striped gifts to complete Level 5 and receive a Magenta Diamond Flair! Collect all 24 gifts to complete Level 6 and receive a Gold Diamond Flair! Members must be on the new Paltalk for Desktop to view and send the game gifts. Members on Paltalk Classic or the iOS or Android mobile apps do not qualify. Download Paltalk for Desktop here on a computer. Flair is awarded within five minutes of completing the level. When more than one level is achieved, only the most recently received Flair is displayed. Members can access previously earned Flair by visiting their MyPalTalk home page. Flair expires 7 days after the award date. No limit to the number of times the game can be played. Entering at any level in the game is permitted. Members may gift themselves and/or their Pals. Login now and send to win! Don't have Paltalk for Desktop? Download it here and start playing!